The disposable cut Christmas tree of yesteryear is today a valuable addition as organic material used for mulch, compost and soil improvement. Gone are the days when trees were simply tossed to the curb where it became a heterogeneous mixture when combined with all the other Christmas discards destined for the landfill. 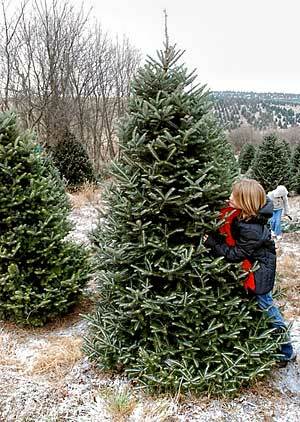 These days, most municipalities will pick up your tree for free where it’s separated from landfill trash. Trees are collected for composting or shredded into mulch with infinite uses and benefits. Even if no such service is available in your area, there are locations around every town that will accept your tree for free. Or consider organizations such as the Boy Scouts of America who will, for a nominal fee, pick up your tree and take it to the appropriate location for recycling. Similarly, consider obtaining some of this shredded mulch for your own garden and landscape. The price is right and at this time of year, you should have no trouble sourcing the material. In the event any of those options are more than you want to deal with, a discarded tree left to decompose on its own can provide important shelter for birds and wildlife as it breaks down. Keep in mind for any tree being recycled, it should be free of that silver tinsel stuff. It’s made of plastic, which never fully biodegrades. Bad stuff for the environment. ps. I read all you articles, they are great. My sister disassembled her old artificial Christmas tree and used the limbs to make “Porch Pots.” Those are outdoor pots filled with evergreens, red berries, birch tree limbs, and other decor. You see them alot outside stores as wintertime decoration. Sometimes you’ll see them in hanging baskets as well. You could reuse the limbs year after year until they are really useless! Recycling old artificial Christmas trees. Most towns and city’s have metal Recycling centers . MOST artificial trees are metal wire core structure designed and these types of places will take them as well as the wire lights on them . Hopefully this helps. Good point John. Thanks for mentioning this. No suggestions for the artificial tree but wanted to mention that if you have a pond on your property you can throw your cut tree there. It creates a habitat for the fish and will eventually decompose. Wanted to add another resource for Christmas trees could be a people with goats. Make sure before hand free from things such as lingering tinsel or metal hangers. Great idea and good word of caution too. Thanks Julie! Joe, what about artificial trees? We purchased our tree back in 1997, pre-lit and used it through this past Christmas. It is worn out and the lights have begun to go out. Is there a way to dispose of this tree in some positive way on our property? Yikes. That’s good question. And part of the challenge of dealing with an artificial tree at the end of its useful life. I have had people write occasionally that tell me they disassemble the pieces and recycle the metal and so forth. But practically speaking, I doubt many people will go to that much trouble. Your question was how to make use of it on your property. I just don’t have a good answer for you here because I can’t think of one that wouldn’t end up looking tacky. Perhaps other readers of this post will have some good ideas. I’d love to hear them too.